The wonderful world of puppies! Puppy grooming is very intricate training that can dictate how your bundle of furry love will react for the rest of its life towards being styled and bathed. If a groomer doesn’t understand the different stages of puppy-hood, they can easily turn him/her into a behavioral dog that will be refused by shop after shop. If your little one will require regular grooming throughout his or her life, his first, second and third visits are the most important. Most grooming shops offer a bath and tidy for the first visit, but what it entails is often vague depending on the shop. 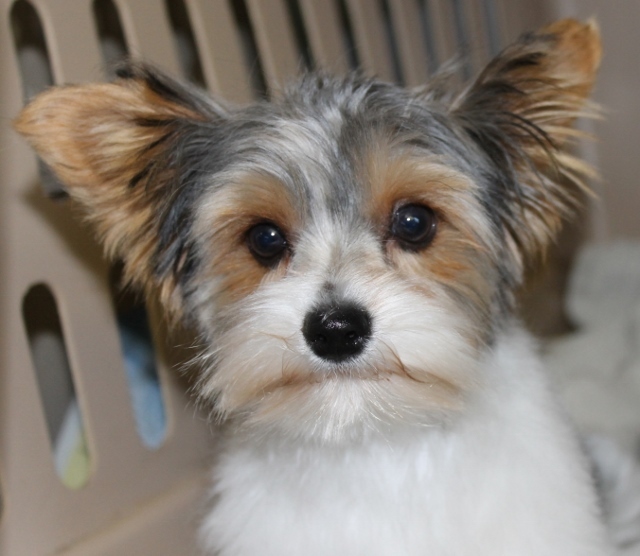 The Garage Grooming Shop, offers a complete three part training program for puppies. While grooming several behavior dogs, I noticed a common thread...the problems began after the second visit when the dog was under six months. I developed a specialized program focused on puppies as there was none available to follow and have been using my program since 2005 with 100% success. WHO IS ELIGIBLE FOR THE PUPPY PROGRAM? The program starts at twelve weeks of age or older. 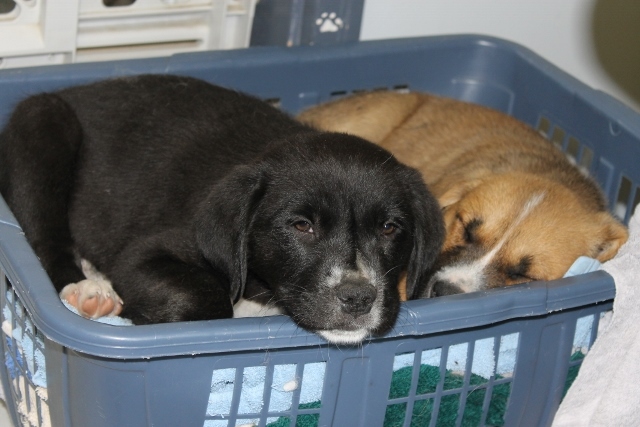 They must have current vaccinations and must be healthy (no ear mites, vomiting, diarrhea or coughing). The oldest I will accept them into the program is twenty weeks. ALL BREEDS are eligible and encouraged to participate in the program, whether you have a lab or a poodle. There is so much training with the program that goes beyond the grooming shop, that it is beneficial for all breeds, even if they never set foot in a grooming shop after the program. You're probably asking why you would put your lab into a puppy program when you have no intention of ever taking him to a dog shop, right? The program is important for all puppies as they learn to get handled by a stranger. Many of the positions, handling and exercises they learn are the same things they will experience at the veterinarian office during their yearly visit. Many of the exercises they learn will be used by you at home. You'll be wanting to handle their feet as adults to wipe water and dirt off. You could wind up having to medicate infected ears, clean dirt and grunge out of eyes, clean any scratches or cuts on the head, face or body. Your new family member learns how to be brushed which will make life easier for you at home when you brush him. They are taught to allow handling of difficult areas with positive reinforcement. The program takes into account any calamities that your young dog may come across throughout his life. It has been my experience that male dogs, who have no experience with clippers prior to getting neutered, tend to be very cautious or aggressive around their back end after neutering. The last thing they hear before they drift off into a deep slumber is the sound of the clippers. Upon waking, they are missing very important body parts. They associate the clipper sound with losing their testicles. To off set this fear, everyone in the program, gets to feel the clippers running on every part of their body without actually cutting any fur. If a large breed dog has had a positive experience with clippers as a young dog, they will accept them later on in adult hood with ease. This is important especially if he cuts his leg and has to get the area around the cut shaved or shaved for blood tests or an IV. To do this with a hundred pound dog that has never had a positive experience with clippers, is very dangerous. Taking into account 'what might happen', we apply it to the Program. The program is stretched over two-three visits. Breed and age will dictate whether two or three visits will be required. Short haired breeds such as bloodhounds or labs will only need two visits, where as a shih tzu or labradoodle will need three. A twenty week old teenager can handle bigger chunks of learning and will require only two visits where as a younger puppy needs smaller chunks of training spread over a longer period of time. Your furry bundle gets a bath, blow dry and trimming of the body and face each visit. Training is practiced from previous visits while introducing new things and expanding on what he/she has learned previously. The third visit includes a full groom and style to your specifications. Each visit is four weeks apart. Should you wait seven weeks between visits, you will be charged for a regular groom. Of course, under special circumstances, if the puppy is sick or a family emergency arises, allowances will be made, however, timing between visits is important. You may have to do homework at home if there are trouble spots with certain areas of his/her body. PLEASE, do the homework. It's easy, not time consuming and makes a world of difference. The puppies are introduced to all equipment they will come in contact with in grooming shops. Each piece of equipment is introduced in a step by step, safe, positive manner, allowing the puppy to become accustomed to the equipment on his terms. This gradual introduction eliminates much of the fear many dogs exhibit towards some of the equipment. They are put through a variety of exercises that they will need to learn for future grooming, such as different head and body positions, different methods of brushing, nail clipping/grinding, ear plucking, mouth handling and foot handling. All this is taught is a step by step manner introducing the puppy to one thing at a time and allowing him/her to investigate each item thoroughly. Each position is taught before equipment is introduced. The pups go at their speed, not the groomers, and a twelve week pup is never on the table for longer than ten minutes. The noose isn't introduced until the third and final visit. I don't use a noose on a young puppy as they will often panic increasing the possibility of damaging their throat or neck. The puppy is always secured on the table by the groomers hands either holding the puppy or holding a collar or harness. Play is a large part of the program. They are allowed to chew on brushes, combs, and scissors (only rounded end scissors secured closed by tape). Praise is the mainstay, as they are praised even if they sort of do something right. Food is also used, a variety of cheese, peanut butter, cooked liver or wieners. Food is used for bribing or distraction rather than a reward. It has been my experience, that play and praise at this age is more beneficial. The puppies learn to work for praise as not every grooming shop will give them a treat reward for the rest of their adult lives. The one exception is if you request that your puppy be clicker trained for grooming. In this case, if you are clicker training at home, I will compliment that training by using clicker training in the shop. Go for a walk before your appointment. List any questions you have on paper. If you have previously arranged to leave your fluffy baby at the shop all day, bring food for a mid-day meal. DO NOT bathe him/her prior to the groom. We promise not to look down on you for having a dirty puppy. Honestly, we like them when they are filthy. DO NOT bathe your puppy in-between appointments without following bathing instructions from the groomer. 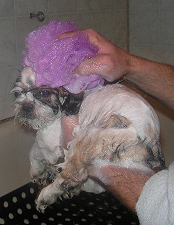 Improper bathing methods can result in severe matting. DO NOT just pop in because you're in the neighborhood. Call first. When you pick up your puppy, tell him/her how wonderful they look. Feel free to ooooo and ahhhh over them. Your puppy will be very tired after the first and second visit. Let them sleep at home. They have learned a lot and will need some quiet time to assimilate all they have been taught.